Eriks and Andy Ramans at the San Andreas Regional Center “Service Above Self” Award dinner where Eriks was honoroed. A happy man with a big heart and a wicked sense of humor, Eriks Ramans epitomizes how people with disabilities can live a full and productive life. 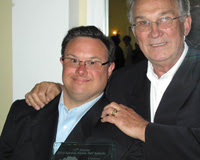 His charming personality, his engaging humor, his commitment to the community, and his enthusiasm for everything he does makes him a natural and recognized role model and advocate for people with disabilities. Eriks simply loves life, he loves his life; and that is a positive example to the entire world. Eriks has been a client of Abilities United for as long as he can remember. Born with Down syndrome in 1971, Eriks started with what is now Abilities United when he was six months old. He began in the early intervention program, where he learned to walk, talk, and feed him self. Over his lifetime, he has participated in a broad range of programs at Abilities United. In recent years Eriks has been in the Independent Living Skills program, which has enabled him to get his own apartment. Eriks has also participated in the Abilities United Employment Services program, and he’s worked well over ten years at great companies like Marriot and Safeway. He takes great pride in being a hard worker, and continues to improve his job skills through ongoing training at Abilities United and through volunteer activities in the community. “Abilities United is family to me,” says Eriks, while flashing his usual big smile. At Abilities United, Eriks is family to us too, and we’re proud to have such a fine, inspirational man as one of ours. Based on an interview with Eriks and Andy Ramans in 2012. Written by Bob Thomas. Edited by Eriks and Andy Ramans and Wendy Kuehnl.